Dr. Laurence Cox, one of the core researchers of the Dhammaloka project, has been interviewed by Eoin O'Mahony for The Religious Studies Project Podcast. It goes in depth into the history of Dhammaloka and a great listen for those of you who want a more articulate and academic point of view as opposed to my enthusiastic yet scattered ramblings on the subject! You can listen on their website here or subscribe on iTunes here. I had the very great pleasure of having a chat with Michael Morey, the host of the Mind Left Body podcast. Michael is a great guy and I enjoyed talking with him. He was very enthusiastic about the film, personable and fun. You can listen to it above or download it on iTunes here, search for Episode 22. London based painter Maddy Maine sent me the above tweet. I think its amazing that the story of Dhammaloka is resonating with people all over the world. Recently I was a guest of Jennifer Hillman on her Abstract Illusions Radio show based out of Arizona USA. We spoke a lot about Dhammaloka in the interview and a little on my background as an animator. From what I can tell, my voice track was recorded at a different bitrate than Jennifer's resulting in an unusually pitched down sounding voice. If you know my voice, it does sound a wee bit strange! From what I understand, the show has already been broadcast and currently the show is on rotation as part of a live stream. As a result there is no real way to directly link to the show right now, so I am presenting it here. 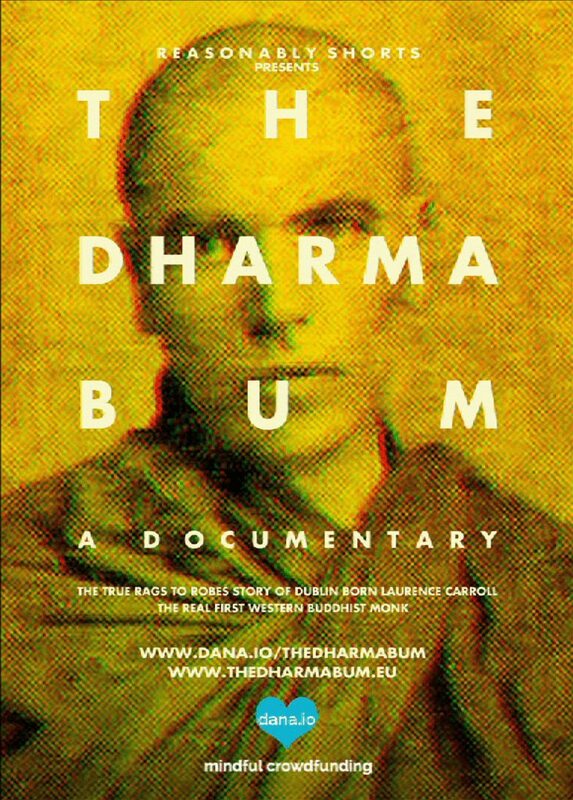 I am very proud to reveal Dhammaloka, a century after his death, in his new incarnation as an animated character in a film about his life! The design & layout for the animation was done by Paul Bolger. The clip was animated by the venerable Rafael Diaz Canales who also did the compositing work. Personally, I wanted to have my hands, so to speak, on the animation so I drew and painted the background. The music again was The Dharma Bum theme composed & performed by Mumblin' Deaf Ro. It features audio clips from the Dhammaloka Team, Alicia Turner, Brian Bocking & Laurence Cox and the tag line was delivered by voice artist extraordinaire, Steve Wilson. I brought the whole thing together using my trusty old copy of Final Cut Pro 7. I hope this new trailer encourages you to share this project far and wide and show what we are capable of doing as a team. Please visit our Dana.io page and contibute what you can. We have come so far, but still have a long way to go! PS Do click on the fullscreen button for the full effect. First look at Dhammaloka animated! The new trailer will be available to watch very soon. We can't wait to share it with you. Animated & composited by the supremely talented Rafael Diaz Canales, layout & design by legendary Paul Bolger and painted & directed by me, Ian Lawton. The good people at Säkularer Buddhismus, a German language online resource for Secular Buddhism has published an article on Dhammaloka. It was written by Evamaria Glatz after hearing the episode of Ted Meissner's Secular Buddhist podcast that I was a guest on. Most grateful to her for doing so. Google Translate doesn't seem to do it justice so I envy those who sprechen sie deutsch! I am delighted that news of Dhammaloka and The Dharma Bum are spreading to different territories around the world. Long may it continue. Off the top of my head, we've pretty much managed to get news to everywhere in the world apart from South America, the continent of Africa and the Russian territories. Approximately 15 years ago I called New Zealand my home for a short few months. I paid taxes, so I can say confidently that I lived there. I found the people of NZ to be some of the most welcoming people in the world. It comes as no surprise that I was contacted by Ramsey Margolis of Secular Buddhism Aotearoa New Zealand considering their hospitality. They republished an article I originally wrote for Ireland-calling.com (see the press page) on their website which is full to the brim with intresting articles. So grateful to be included. I look forward to one day visiting the islands again and hopefully screening this film. I've been listening to The Secular Buddhist podcast with Ted Meissner (Pictured) for some time. In fact, the first two unofficial episodes of the show, where Ted was a guest on Atheists Talk, a show on Minnesota radio, that comprise the first episodes of the show, were very instrumental in my "coming out" and becoming comfortable in admitting that I, a staunch atheist was becoming Buddhist. It was an absolute pleasure to be invited on the show to talk to Ted, not only about my film about Dhammaloka, in which we go into great detail, but to also discuss, my Catholic upbringing, subsequent atheism and in turn, embracing Buddhism. Ted is a very amicable, personable interviewer and we had an opportunity to have a great off the record chat before and after the recording. A great guy. A great show. A great organisation. I encourage you to check out other episodes of the show, especially the first two from 2009. A collection of updates on the progress of the film.